Established in 1998, Webjet is the leading online travel agency (OTA) in Australia and New Zealand, leading the way in online travel tools and technology. Webjet’s focus has always been to offer the greatest convenience and choice by enabling customers to compare, combine and book the best domestic and international travel flight deals, hotel accommodation, holiday package deals, travel insurance and car hire worldwide. 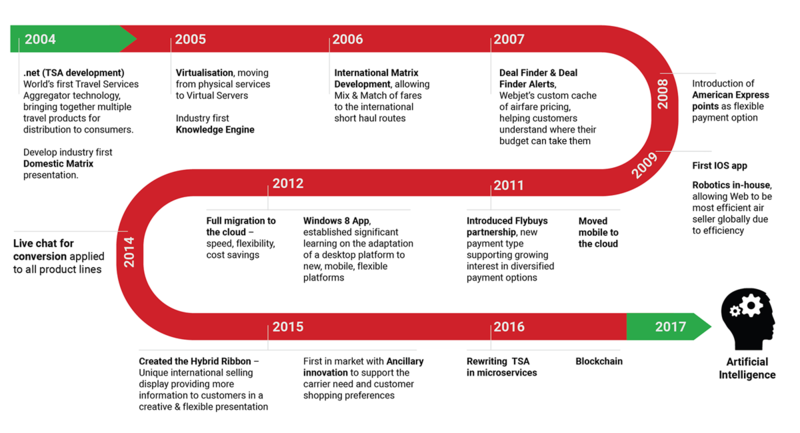 Since inception, Webjet has been at the forefront of online innovation – from the world’s first Travel Services Aggregator technology through to leading the industry in blockchain innovation. Acquired in May 2016 to leverage Webjet’s core capabilities into attractive complementary travel segments, Online Republic is a market leading global e-commerce group based in New Zealand specialising in online bookings of rental cars, motorhomes and cruises. Airportrentals.com and Motorhome Republic are leading players in global online bookings for car hire and motorhomes and Cruisesalefinder is the leading Australasian online Cruise agency. Webjet established its B2B travel business – known as WebBeds – in 2013. The global B2B market is estimated to generate Total Transaction Value (TTV) of more than $50 billion and involves the fulfillment of hotel bookings for a range of travel providers including travel agents, brokers, tour operators and OTAs. Unlike our B2C business which provides services direct to the consumer market, our B2B business helps wholesale players fulfil accommodation requirements for their consumers. 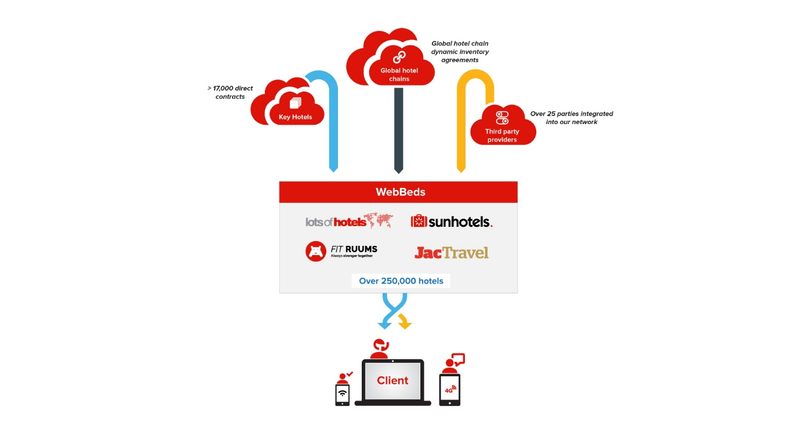 WebBeds sells hotel rooms to our partners via the online channel and plays a key role as intermediary between travel providers seeking to fulfil accommodation requirements for their consumers and the 250,000+ hotels globally seeking to manage their occupancy rates. WebBeds provides a simplified business-to-business solution that aims to offer the widest range of inventory at the lowest prices. We operate a unique multi-supply aggregation strategy that allows us to source hotel rooms from a variety of suppliers. In addition to directly contracting room allocations with key hotels (ranging from independent hotels through to global hotel chains), we also use a wide range of third party suppliers. This approach allows us to offer the greatest breadth and depth of hotel room inventory to our customers. Our low cost structure means we are able to offer inventory at attractive prices. Our WebBeds business currently operates in Europe, Middle East and Africa (MEA), North America and Asia under the Lots of Hotels (LOH), Sunhotels and FIT Ruums brands. The business has grown from a small start-up to a global player generating more than $450 million TTV* in less than 4 years. *Annualised TTV run rate based on 1H17 financial results. The WebBeds business was launched in February 2013 with the establishment of Lots of Hotels based in Dubai. Lots of Hotels is now the #3 player in Middle East and Africa, operating in 28 markets and providing unique coverage to thousands of travel partners across AMEA region. Lots of Hotels Americas Division was launched in November 2015 targeting wholesalers in North America and the LATAM region. The distribution network continues to grow to include major cities of Montreal, Toronto, New York, Washington, Orlando, Las Vegas, Brazil, Rio, Buenos Aires, Mexico to name a few. 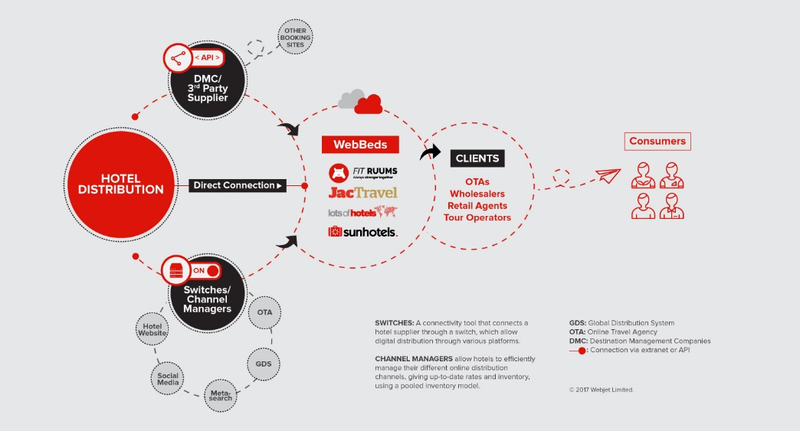 The Lots of Hotels technology platform currently offers over 250,000 hotels worldwide sourced both directly from major hotel chains and via leading third party suppliers. LOH technology supports API, HTML and White Label solutions. 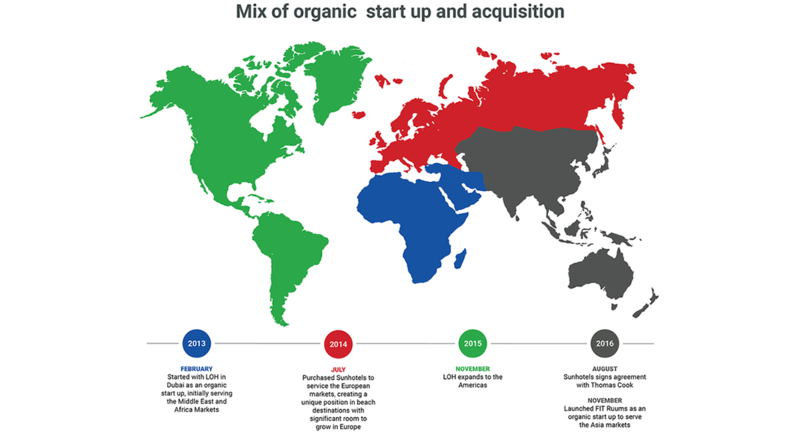 Acquired in July 2014, Sunhotels is an established European B2B operator and market leader in the Nordic countries. Sunhotels has a strong global position in beach properties and has significant growth opportunities in city destinations and new European markets. In August 2016, Sunhotels announced a strategic sourcing partnership with Thomas Cook, one of Europe’s leading tour operators. The agreement will see Sunhotels take responsibility for contracting the majority of the volume of Thomas Cook’s complementary hotel business (the part of the business that does not use Thomas Cook branded hotels). The transition is currently underway and full implementation is due by January 2019. The Sunhotels technology platform currently offers over 130,000 hotels worldwide. Launched in November 2016, FIT Ruums focuses on B2B travel distribution for worldwide hotel accommodation and transfers in Asia. FIT Ruums offices are now open in Singapore, Hong Kong, South Korea, Indonesia, Taiwan, Malaysia, India and Thailand. In November 2016, FIT Ruums announced an exclusive alliance partnership with DIDA Travel, the #1 B2B travel distributor in China, providing it with a strong foothold into the Chinese market. The FIT Ruums technology platform offers over 130,00 hotels worldwide. Acquired in September 2017, JacTravel is one of the leading suppliers of hotel accommodation for the global travel industry and a provider of specialist inbound group travel services to the UK, Ireland and Europe. With offices throughout the UK, Europe, Asia, the Middle-East and North America plus worldwide representation, its team of over 550 travel professionals is well placed to serve its 20,000 clients globally. All this is facilitated by a directly contracted inventory of more than 17,000 hotels, and an additional aggregated portfolio of over 170,000 properties plus an extensive range of preferred group tour suppliers. The acquisition of JacTravel has resulted in WebBeds becoming the #2 player B2B player globally and the #2 B2B player in the important European market. Our aim is to be a leading global B2B player. As our businesses continue to grow in each region, we are able to cross-sell inventory offerings between the various businesses providing the broadest range of distribution capability to our hotel partners, and delivering the broadest range of choice to our agency partners.